Thanksgiving Organization: Are You Ready? It may only be September, but before you know it, Thanksgiving will be right around the corner. It’s never too early to begin prepping for this much-awaited holiday, which brings family together at least once a year. Barbara Reich, author of SECRETS OF AN ORGANIZED MOM, shares her advice on how not to be too overwhelmed while cooking, cleaning, and entertaining your house guests. Every Thanksgiving, I’m thankful for many things: my loving family, good health, and fulfilling career. I’m especially thankful that I don’t have to host Thanksgiving dinner. On Thanksgiving morning, my family participates in the Turkey Trot, a multi-generational 5K race. While my father-in-law, husband, and son try to beat previous years’ records, my mother walks, I run so slowly I may as well be walking, and my mother-in-law rides in a golf cart. My daughter collects t-shirts and takes pictures. After the run, we have a relaxing day at the beach. Dinner is eaten in a large restaurant with many other families. While it may not be the most intimate of settings, I love not having to spend the day cooking and cleaning. If you’re not as lucky as I am and you’re hosting the meal, it’s important to plan ahead so you can enjoy the holiday. Start by determining who will be on the guest list. When you invite someone, and they ask what they can bring, do not be a martyr. Tell them very specifically what they should bring. If they have a special dish they like to make, by all means take them up on it. With any luck, this will lighten your load significantly. Determine the exact game plan a few weeks before the big day. 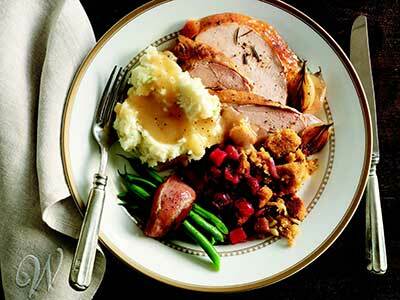 Select the menu and keep it as simple as possible—turkey and two or three side dishes. Make your grocery list and shop for non-perishable items. Prepare anything that can be made in advance. Figure out the flow of the kitchen. How long does each item need to cook, what can be in the oven at the same time, when does each dish need to go in and come out of the oven? Think about what time you’ll shower and dress, and what time the children will bathe and dress. Know what everyone will wear (including yourself). Write this all down, so you don’t forget a single detail. On the night before Thanksgiving, set the table. Or, if your children are old enough, let them set the table. Engage your children by allowing them to decorate the table with homemade crafts. They can also make and decorate place cards. If there will be a large group of young children invited, you may want to select a movie in advance that can be watched if 10 shrieking children descend into complete chaos, and you crave quiet. If you follow these tips, on Thanksgiving morning you should be calm and ready to start crossing things off your list. You have your game plan and you’re ready to execute. If you have the opportunity, do some exercise in the morning; it will give you energy. Unless having your spouse and children around is helpful, send them out of the house for as long as possible. And if things start to feel out of control, there’s no shame in ordering in a few pizzas and calling it a day. It’s the sentiment that counts! You won’t want to miss these yummy Thanksgiving recipes. 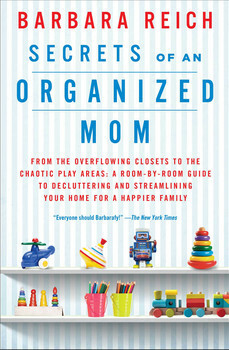 For more advice on how to plan for the holiday season check out SECRETS of an ORGANIZED MOM by Barbara Reich. Also from Tips on Life & Love: 5 Plan-Ahead Thanksgiving Tips: Start Now! Share Thanksgiving Organization: Are You Ready?